So, you got away with the Genie's Gems the first time and thought you were pretty slick, huh? Click here to play! Well, can you do it again while also claiming the eggs of the Golden Goose hidden in the very same palace? I'm sure a master thief such as yourself would have no troubles, but let's see you prove it. The Golden Goose - Genie's Gems slots take excellent Genie's Gems 5-reel slots and add what players have wanted all this time - an awesome bonus game! Simply by placing an additional side bet, you will get a random chance at the end of each spin of the reels to start playing one of four Golden Goose bonus games. Forget about just searching for the Genie, as now you have a Golden Goose to find that could payout even better. Grab your falchion and magic carpet to set out on an adventure in the Golden Goose - Genie's Gems slots. By sneaking into the palace and finding the lamp and gems, you could summon the ancient Genie. Who knows, he might point you on your way to the Golden Goose and a fortune in solid gold eggs. The Golden Scatter symbols payout on the total bet when 3 or more land on the reels. 3 payout 5 times the total bet, 4 payout 20 times the total bet, and 5 symbols payout 400 times the total bet. The Genie symbol is wild and substitutes for any symbol other than the scatter symbol. Wins that the Genie substitutes in are triple their normal prize amount. The Golden Goose bet must be played for the bonus to be active. Anytime the Golden Goose bet is played, the bonus has a chance of activation after the spin has completed. There are 4 different games to play. The first game is the Golden Egg Bonus, where a golden egg worth up to 2,000 coins is awarded to the player. The second game is the Golden Reels Bonus, where players choose an egg from each reel to reveal prize amounts. 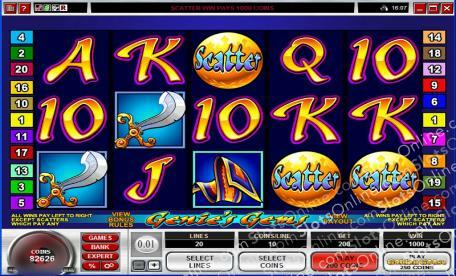 The third game is the Money or the Egg Bonus, which has the player choosing Money, with a random prize value, or the Egg, with a random number of free spins at a random prize multiplier. The fourth game is the Pick a Card Bonus. This involves the player picking 1 of 5 cards to win up to 11 spins with a 6 times prize multiplier. Autoplay can be set for up to 500 spins. It may also be set to stop on a win of a certain amount. The side bet is always made on autospin in this slot machine.